Solar Egg is a social sculpture, where both locals and visitors to Copenhagen can meet. In the Nordic countries, the sauna holds a key position as a space for warmth and reflection. Picking up on this tradition, Bigert & Bergström (b. 1965 and 1962) have developed a symbolic sculpture intended as space for conversations and the exchange of ideas. The project reflects the artists’ overall strategy of incorporating the climate in our experience of their art; a recurring trait of their work since they created a series of climate chambers back in 1994. “We are excited to come to Kunsthal Charlottenborg and contribute to the hottest spot in Copenhagen this autumn. Visitors will have the chance to explore Solar Egg up close and inside out”, says artist Mats Bigert. Solar Egg is made of wood and covered in a stainless golden mirror surface whose many facets reflect its surroundings. 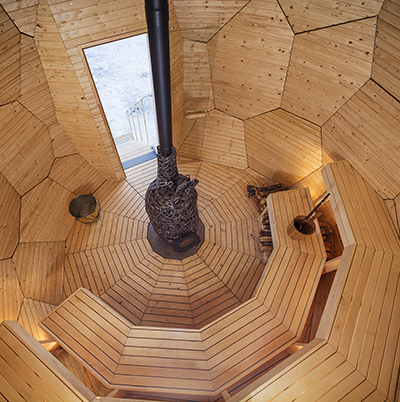 In the centre of the egg is a wood-fired, heart-shaped sauna stove made of iron and stone. The temperature inside the sculpture is between 75° and 85°C and visitors will be able to book sauna appointments three days a week during the exhibition period. 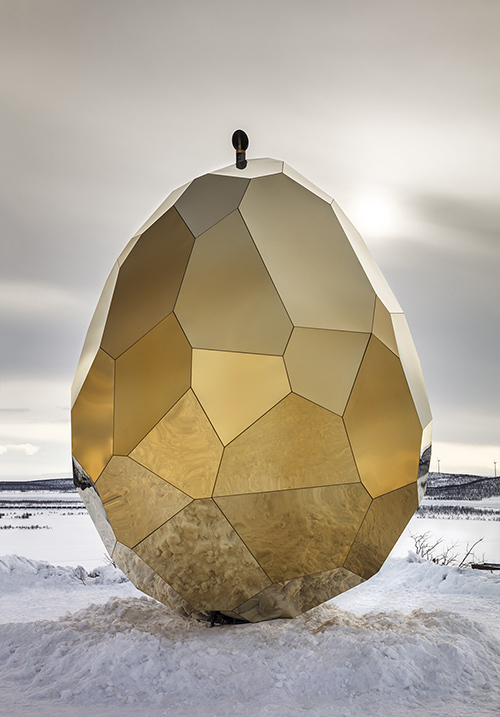 As a symbol of new beginnings, previously Solar Egg has already shared the warmth in several stunning locations around Sweden: Kiruna, Björkliden, Stockholm and this summer in Gällivare. Last year it visited Paris. The Copenhagen-visit opens on Kulturnatten, Copenhagen’s Culture Night 12 October.